Just several days ago, a new book for learning Mandarin Chinese has been published by Yunnan Minority Publishing House, written by Keats Chinese School, a Mandarin language school in Kunming China. The Chinese book named Essential Chinese is proper for the zero-based foreign learners to use, making Chinese learning easier than most people think. The most obvious feature of this book is that the contents are closely related to the realistic life, making it practical and easy to understand. The book Essential Chinese costs only $7 and can easily be purchased in major bookstores in China or online stores. MP3 comes together with the book is free for downloading from Kunming Keats School’s website: www.keatsschool.com. In recent years, more and more foreigners come to learn Chinese in China. Chinese learners hope to attend excellent Chinese schools, but also seek for helpful Chinese learning books. However, most teaching materials are compiled by Chinese people from a Chinese teacher perspective. As a result, learners feel it is hard to learn Chinese language effectively because much attention is paid to the grammar knowledge. In the new Chinese language textbook Essential Chinese written by a Keats School teacher, the author divides the contents to some topics that the Chinese learners often meet when they study in China. By learning in the specific topics, the grammar knowledge is formulized and becomes more interesting. In this way, learners can learn with relaxation. This book can be used as both the textbook for classroom teaching and self-study for those who study Chinese as a hobby. In addition, it can be also functioned as a pocket phrase book for traveling and living in China even though students have never learned Chinese because there are many useful daily vocabularies in it. The Chinese book, Essential Chinese, is helpful in Chinese language learning because it includes 400 commonly used Chinese sentence patterns, 54 topics frequently used in daily life as well as 1,489 everyday words. The foreigners can choose what they want to learn or what they are interested to practice. If the learners who want to learn Mandarin acquire the contents in this book, they will reach the goal of talking and communicating with Chinese people naturally and fluently. Featured in the arrangement, the book is different from those ordinary Chinese books which are arranged by following the order of Chinese, Pinyin and English meanings. On the contrary, the arranging order of English, Pinyin and Chinese in this book brings great convenience to the learners who learn Chinese in China to use. Before the publishing, this book has been used for one year at Kunming Keats School in China, winning the approval and favorable reception of the teachers and students. With a history of eight years, Kunming Keats School in China is a Chinese language school specializes in teaching Chinese as a foreign language. The reason for Keats School to write this book is that teachers at school find it hard to choose a proper book for students who have never studied Chinese. In order to encourage students to learn Mandarin with interest, teachers at Keats School change the boring and unpractical contents, and then add attractive language points in this book. That is to say, this book collects large amount of precious materials after a long time of practice. 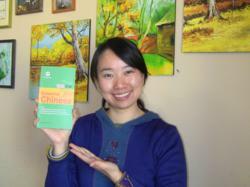 The editor in chief of the book Essential Chinese is Ms. Huang Qiuyan who is the vice president of Kunming Keats School. With a six-year experience in teaching Chinese as a foreign language, she is experienced and also has a good command of English. During the period of teaching in Chinese language school in China, she has published many theses about the Chinese language teaching to the foreigners. Therefore, during the process of writing this book, Ms. Huang takes westerners’ learning habits and thinking style into consideration, thus ensuring the quality of this book.